Situated close the Vanoise park, Saint-François Longchamp is the first ski resort you come to in the Maurienne Valley after leaving the motorway, 15 km from the A43. The slopes in Saint-François Longchamp together with Valmorel en Tarentaise form the Grand Domaine ski area with 160 km of pistes and 83 runs for all levels of skier. It is possible there to pass from one mountain to another and ski down 1,300 metres from one side of Savoie to the other. In addition to ease of access Saint-François Longchamp also has a good snow and sunshine record. 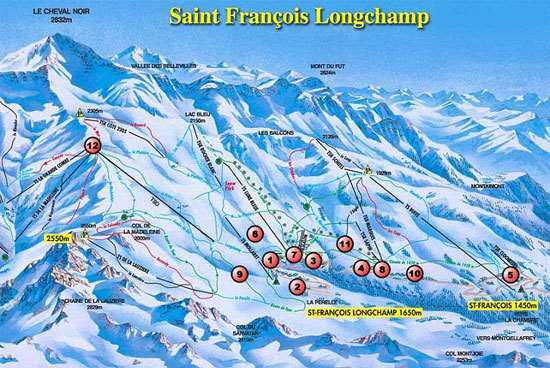 The whole area is a great choice for beginners and intermediates with more easy slopes on the Saint-Francois. However there is enough challenging slopes to keep competent skiers interested for a week. Experienced boarders can try the boardercross course and half-pipe in the snowpark. This modern, purpose built family resort, situated only 60 km east of Chambery, is made of small apartments houses. All services are available: ski school, restaurants, shops, banks, doctors and chemist.